The process by which one class acquires the properties(data members) and functionalities(methods) of another class is called inheritance. The aim of inheritance is to provide the reusability of code so that a class has to write only the unique features and rest of the common properties and functionalities can be extended from the another class. The class that extends the features of another class is known as child class, sub class or derived class. The class whose properties and functionalities are used(inherited) by another class is known as parent class, super class or Base class. Inheritance is a process of defining a new class based on an existing class by extending its common data members and methods. Inheritance allows us to reuse of code, it improves reusability in your java application. Note: The biggest advantage of Inheritance is that the code that is already present in base class need not be rewritten in the child class. This means that the data members(instance variables) and methods of the parent class can be used in the child class as. To inherit a class we use extends keyword. Here class XYZ is child class and class ABC is parent class. The class XYZ is inheriting the properties and methods of ABC class. In this example, we have a base class Teacher and a sub class PhysicsTeacher. Since class PhysicsTeacher extends the designation and college properties and work() method from base class, we need not to declare these properties and method in sub class. Here we have collegeName, designation and work() method which are common to all the teachers so we have declared them in the base class, this way the child classes like MathTeacher, MusicTeacher and PhysicsTeacher do not need to write this code and can be used directly from base class. The derived class inherits all the members and methods that are declared as public or protected. If the members or methods of super class are declared as private then the derived class cannot use them directly. The private members can be accessed only in its own class. Such private members can only be accessed using public or protected getter and setter methods of super class as shown in the example below. The important point to note in the above example is that the child class is able to access the private members of parent class through protected methods of parent class. When we make a instance variable(data member) or method protected, this means that they are accessible only in the class itself and in child class. These public, protected, private etc. are all access specifiers and we will discuss them in the coming tutorials. 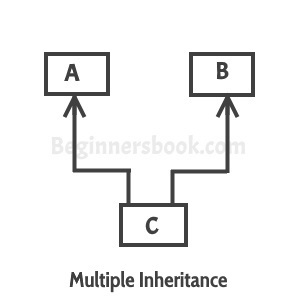 To learn types of inheritance in detail, refer: Types of Inheritance in Java. 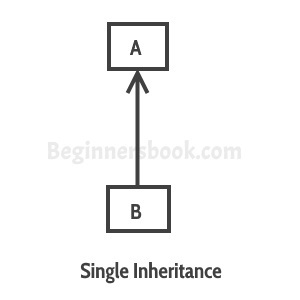 Single Inheritance: refers to a child and parent class relationship where a class extends the another class. 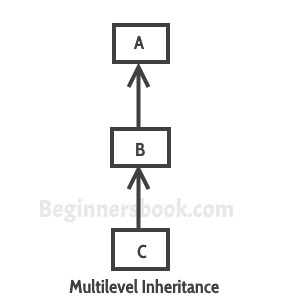 Multilevel inheritance: refers to a child and parent class relationship where a class extends the child class. For example class C extends class B and class B extends class A.
Hierarchical inheritance: refers to a child and parent class relationship where more than one classes extends the same class. For example, classes B, C & D extends the same class A. Multiple Inheritance: refers to the concept of one class extending more than one classes, which means a child class has two parent classes. For example class C extends both classes A and B. Java doesn’t support multiple inheritance, read more about it here. Hybrid inheritance: Combination of more than one types of inheritance in a single program. 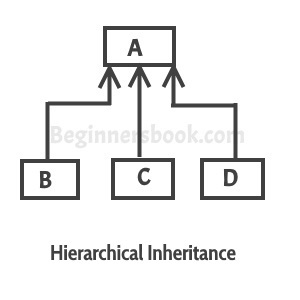 For example class A & B extends class C and another class D extends class A then this is a hybrid inheritance example because it is a combination of single and hierarchical inheritance. constructor of sub class is invoked when we create the object of subclass, it by default invokes the default constructor of super class. Hence, in inheritance the objects are constructed top-down. The superclass constructor can be called explicitly using the super keyword, but it should be first statement in a constructor. The super keyword refers to the superclass, immediately above of the calling class in the hierarchy. The use of multiple super keywords to access an ancestor class other than the direct parent is not permitted. * You can use super() to call the constructor of parent. Its simple to understand and it provides good examples.